Why Not Seek A French Majority Through Peace And Love? If the Pauline Marois‘s of Quebec want to see Quebec’s non Francophone population trying to learn French and even adopting it over time as a first language, what I would suggest is perhaps they get back to what the hippie movement called the Peace Movement and use the power of love to sway the English and non Francophone residents of the province of Quebec to speak French as a first language. If the speaking of the French language was not presented as a must do, that has penalties attached to non compliance (fines, inability to get provincial government services in English and getting bullied in the streets for speaking English), maybe people will not see speaking the French language as something to resist doing at all cost, because to speak it is somehow giving up a right instead of taking advantage of a chance to learn a beautiful language and having a distinct advantage over other Canadians in the job market by being able to work in both official languages of Canada. The approach used by sovereignists so far in the province of Quebec has been to intimidate and to force through elimination of English services the compliance with its French only in Quebec goals and the more this happens the stronger the resistance to it grows until even the people who can speak French and understand it, simply refuse to do so. Those who were once trying to learn French have developed such a loathing for the language that they form a mental block and are convinced that they can not learn the language and when this happens no amount of arm twisting, coercion, or intimidation will be of any use in getting these people to embrace the French language. I am a person that does not do well when someone tries to impose anything on me and I am not alone. I can speak French and I understand it, all my children speak French and my grandchildren will speak it too, because I have been taught and my children have been taught that the more you know the better off you are. If Pauline Marois gets her way blocking French kids from going to English school and French children lose their ability to speak English, Pauline Marois will have given the bilingual residents of Quebec a distinct advantage in the job market and gained nothing for her French only residents of Quebec and her cause. My family’s protest against her and her followers onslaught is a simple one and it works. No member of my family will spend any of our Canadian dollars, not one nickel, where a business does not offer service in both official languages with a smile. It is amazing how store owners stop refusing to speak English when it hits them in the bottom line and interferes with their livelihood. If I were seeking French to remain the language of the majority of people in the province I think that I would have tried to reach out to the young people of the province on both sides of the language debate and encouraged a friendly mingling, instead of setting one against the other which encourages distrust, hard liners and violence. Perhaps through youngsters finding out that they have more in common with each other than differences and nature being allowed to take its course, the question of French verses English as a first Language could be rendered moot. The children of mixed French and English couples might just grow up without the pre-existing biases and prejudices and with the ability to speak both languages from the home. French is a beautiful language and should be sold as such, but it should always be remembered that it is a language that outside of Quebec is not necessary to know in order to work, or earn a living in Canada, or in most of the world. It should also be remembered that it is to ones advantage to be bilingual, especially in the Canadian work place whether it is French, or English that is the second language. Quebec’s first initiative to ensure its population count grew in my opinion was a disaster and did more to encourage young people to have babies that they could not have afforded to have in the first place and maybe should have waited to have until they were more solidly on their feet. What the Quebec government of that day did was, attempt to increase the population of Quebec by offering the only people who would jump at this deal, cash money to have babies. The Quebec government actually threw money at young, poor, uneducated people to have babies. French, English, non Francophone young, poor kids took the deal and had babies for the immediate cash and when their limit of babies was reached they struggled to raise their babies on welfare. How do I know they were the young poor kids; ask yourself, who else would take this little bit of money to have babies for their province? Pauline Tam, of The Ottawa Citizen wrote: Quebec, in an act of cultural self-preservation, has tackled longstanding declines in fertility by experimenting with baby bonuses. Between 1988 and 1997, the government offered payments of up to $8,000 for women to have more children. Enough mothers took advantage of the allowance that 14.5 per cent of all births during that period, or an estimated 93,000 babies, could be directly attributed to the program. The Quebec government justified the cancellation of the baby bonuses by saying the program didn’t work. The next solution to saving the French language in Quebec that this brilliant group of politicians and their followers came up with was to remove non Francophone words from signs, forms and now even menus. I kid you not, in Quebec we actually pay people to go around and measure the words on signs to make sure that the French words are not only visibly larger but are the larger specified by law. Everyone in the world now knows that the language police of Quebec thought that by harassing restaurant owners and trying to force them to remove non Francophone words like pasta from their menus was inline with the Parti Québécois initiative to save the French language in Quebec. People have said that I am not seeing the situation for what it really is in Quebec and the separatists are just seeking to preserve their language and I am overreacting and out of touch, but I do not see the humor in this story and wonder why Jean-François Lisée replied with a smile, when asked if it was overkill, that it was overdone. CBC News reported: The Office québécois de la langue française (OQLF) said it may have been over-zealous in its attempt to promote French language in public places. When asked whether he thought it was overkill to require the translation of the word ‘pasta,’ Parti Québécois minister responsible for Montreal, Jean-François Lisée replied with a smile, saying he thought it was “overdone.” The minister responsible for the OQLF, Diane De Courcy, called the situation “surprising” and said she would look into it. Which brings us up to todays approaches by the Quebec government to secure the French language as the 1st language of the majority of people residing in Quebec. It is, not all that original, or innovative, but then racism and ethnocide does not require imagination, just a fanatic group, terrified that not enough of the population wants to be like them and so they see the decline of their mother tongue as eminent and their culture slipping out of prominence. This possibility so terrifies these fanatics that they can think of nothing more important that to do anything it takes to remove what they feel will cause the extinction their goal of a French only Quebec, like the age of the dinosaur and bring forth a new era of bilingualism. I feel sorry for them not knowing that the key to their survival is in uniting all of the people of Quebec. There was a time when Rene Levesque spoke and I understood what the francophone fight was all about and although I would not have agreed with separation I would not have feared for my very existence if it happened. The mood in Quebec, in Montreal is ugly, and the Parti Québécois is putting the match to the gasoline for political gain. Barbara Kay, of the National Post said in an article: On Wednesday M. Lisée unleashed a new barrage of hollow banalities on the CBC’s The Current: “When we look forward for the next generations, our aim is to have a French majority that is secure and an anglo community that is secure…” and “what we’re trying to say is that it’s not a battle any more, it’s a common cause.” The anglo community in Quebec is not secure. It is in a state of existential crisis. Every move the PQ government makes contributes to anglophones’ sense that they are a community under siege. If it is not a “battle” anymore, it is only because Quebec anglophones are legally and morally disarmed. With so few ridings in their command, they have political suitors in the Liberal and CAQ parties during political campaigns, but no champions in office. They can expect no support from the federal government, whose longstanding policy – Liberals and Conservatives alike – is to avoid gestures that may inflame Quebec nationalism, and to look the other way when the Quebec anglo community’s rights are thrown under the bus. There is no “common cause” in Quebec. Anglophones are second-class citizens watching their already diminished rights, their institutions and their identity shrinking before their eyes. They feel isolated and increasingly vulnerable, as well they should. This is how it is for the non Francophone person living in Quebec. We are not just foolishly panicking because French people want to preserve their language; we are living in fear because no one in the federal government seems to care what happens to us as long as the separatists of Quebec remain content whipping the whipping boy. Have you listened to the French spoken in Quebec? There is so much English in it that if we allowed the French language to evolve naturally the Québécois would be speaking English in no time by their insistence on adding English words to French like, weekend, hot dog, all dressed, just to name a few. Food for thought: We have in Quebec a type of welfare person not found anywhere else in Canada and they are called the unemployable Anglophone. This Anglophone has an advantage if you will when it comes to getting a welfare check than their French counter parts. When a claims officer asks non francophone why they are not working, they do not have to reply because they are sick, or disabled, or the company closed down; they simply have to say that they do not speak French and the conversation is over and they are told that their check is in the mail. This situation can not be good for the economy of Quebec or Canada, but there you have it. This situation exists, because instead of everyone having to be bilingual to hold supervisory or managerial positions, they get to work in the language of their choice and given who holds the majority in this province it becomes next to impossible to hold a job in Quebec if you are a Anglophone. Case officers know that there are just not any jobs left no matter how menial where a non Francophone Quebecer is concerned, and so knowing only how to speak English becomes a legitimate reason to be on welfare, only in Quebec. I am not suggesting that an intelligent rational person would seek to remain on welfare, but I know that the opportunity exists and the excuse is being used to get a check by unilingual and bilingual people who are finding it hard to find a job and want a hassle free way to get a check. I was taught that a wise person tries to make friends out of perceived enemies, because friends are assets and usually allies. Enemies require a lot of work and energy better spent doing other things like making a better life for all, instead of watching them, keeping them fearful and letting them know who is who is in control. It is never good to have enemies within your own camp, but that is the situation in Quebec, as the ethnocide continues and peace and love flies out the window. As the Francophone in Quebec had their revolution and are now practicing reverse discrimination, they forget that there is another revolution taking place right now in Quebec and it is being waged by the Anglophones and the non Francophone, who the separatists in power are oppressing. Pauline Marois and her political party have always used the students of this province to get elected to power. Let us not forget when she was education minister, it was Pauline Marois who introduced the bill, which would eliminate the freeze on tuition on higher education that was in place. Pauline Marois and her Parti Québécois only backed down when it was clear to continue what she thought was a necessary change would cost the party an important voting block. In 2008 George Goulanger states in the Gazette.com, Pauline Marois is under attack these days for suggesting that the Quebec education system should make sure that all children are functionally bilingual when they graduate from high school. She demanded that English be taught from the first grade on, and even that some form of immersion be created, by teaching geography and history in English, for example. As expected, the cowardly right of the independence movement opposed the plan violently. More frighteningly, some intellectual elites, such as author and playwright Victor-Lévy Beaulieu used the T-word. Treason. I think that Pauline Marois has allowed wanting the title of premiere of Quebec to force her to make choices that take all power of the office away from her and render her as a paper tiger, a lame duck or a puppet. Pauline Marois is little more than a ventriloquist’s puppet sitting on the knee of her party, moving her lips mechanically and uttering the words of her elitist bilingual opponents, merely pretending that they are her own. 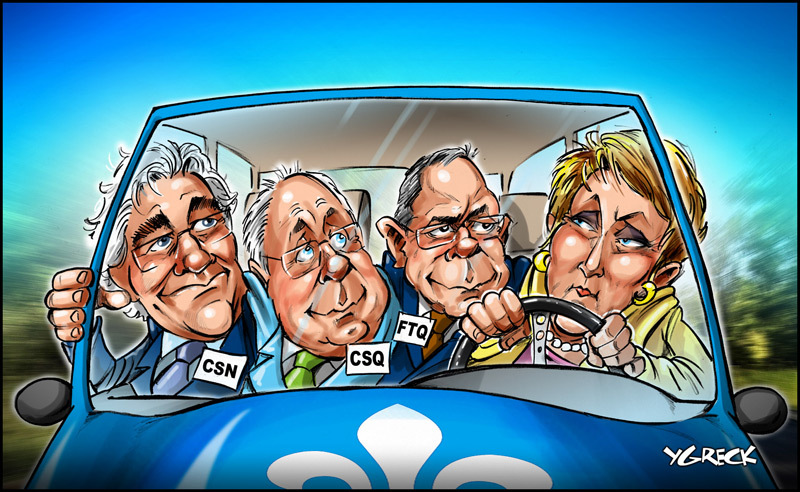 Every one knows who is running Quebec and it isn’t the government, or Pauline Marois. This entry was posted in abuse of power, Canada, feeling rejected, feelings of hurt and hatred, Government, Montreal, Prejudice, Quebec, Quebec's Abuse of Its None Quebecoise Residents (Other Canadians), Schools and Learning Places, Uncategorized and tagged Canada, Diane De Courcy, French language, Jean-François Lisée, Montreal, National Post, Office québécois de la langue française, OQLF, Parti Québécois, Pauline Marois, Quebec, Quebec government. Bookmark the permalink.